We all know that in Wisconsin, when the weather warms up, we like to spend as much time outdoors as possible! And that definitely includes biking. Now that more riders are hitting the streets and the trails, it&apos;s important that they are equipped with vital safety practices. And that also applies to people driving cars, too! Joining us with great safety information is Jake Newborn from the Wisconsin Bike Fed. Wisconsin Bike Fed is a statewide non-profit bicycle advocacy and education organization working to make the ride more safe, fun, and convenient for anyone on a bike in our state. For more information on bike safety and Bike Fed programs, visit WisconsinBikeFed.org. 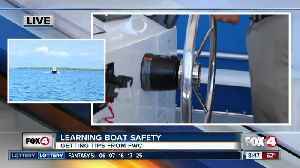 Florida Fish and Wildlife urges visitors and residents to be safe out on the water as thousands flock to Southwest Florida for spring break.